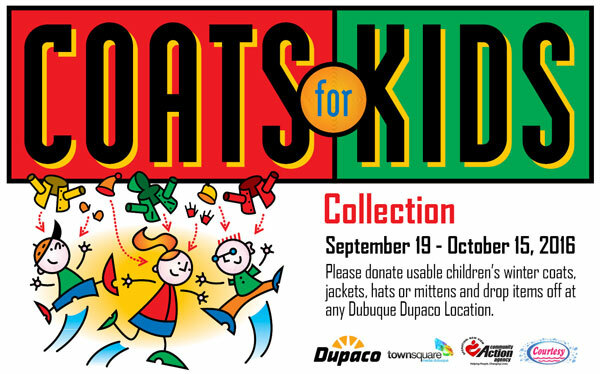 Dupaco Community Credit Union announces the 26th annual "Coats for Kids" drive will be held September 19 through October 15, 2016. Co-sponsored by Dupaco Community Credit Union, Cumulus Broadcasting, Operation New View Community Action Agency, and Courtesy Cleaners and Coin Laundry, the "Coats for Kids" program allows usable children's coats to be dropped off at any Dupaco location in Dubuque during the drive. The collected items are dry-cleaned compliments of Courtesy Cleaners and Coin Laundry and distributed to needy tri-state-area families by Operation New View. Distribution will take place at St. John's Lutheran Church, located at 12th and White St. in Dubuque, on Wednesday, October 26 from 9:00 a.m. to 2:00 p.m. and 5:00 p.m. to 7:00 p.m. Coats will also be distributed on Thursday, October 27 from 9:00 a.m. to 2:00 p.m.